Everyone knows that the Norman Conquest happened in 1066. But it didn't in Upper Eden! It wasn't until 1092 that King William Rufus seized the land of Carlisle from the King of Scotland. By then there had probably been a church at Kirkby Stephen for well over a century. The name 'kirkby' means 'church-place' and comes from Old Norse so it and the church alike probably date from around 900, when Viking people arrived in this area. Today Kirkby Stephen Parish Church houses an important collection of pre-Conquest carved stones. 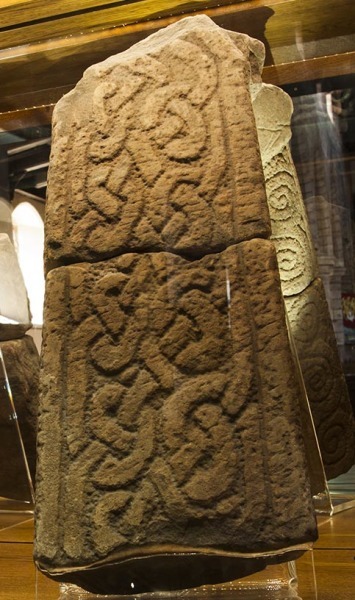 The oldest was carved before the Vikings arrived, when the district was part of Saxon Northumbria. In all we have fragments of three cross-shafts, three cross heads, one shaft that may have been part of early church furniture and one Viking hog-back tombstone. In 2014 the collection was re-housed in a modern show case where it is well displayed and well-lit. This leaflet tells you about the stones and their history. Please go and view them while you are here. We hope that you will enjoy the peace and beauty of our ancient Parish Church, with its Early English arcade built by the monks of St Mary's Abbey, York in around 1230. And, although old, ours remains a vibrant, living, church to whose services you are most welcome! The oldest carved stone in Kirkby Stephen Parish Church probably dates from between 700 and 750 A.D. The fragment, which is broken in half, shows part of a flower with a curving stem and buds and berries below. It would have been part of a much larger pattern on the upright face of a tall cross. It was cut deep so as to stand out from a distance, and it would have looked very striking when the whole cross was painted in bright colours. Such crosses are widespread in northern and western Britain and were set up in places where people gathered to worship and hear preaching. We can imagine it standing here on a grassy knoll above the River Eden, where a simple church was to be built later. The carvings on this stone are typical of the Saxon kingdom of Northumbria which became Christian in around 625. There are similar patterns on stones from Carlisle, Hexham and Wycliffe in Yorkshire. 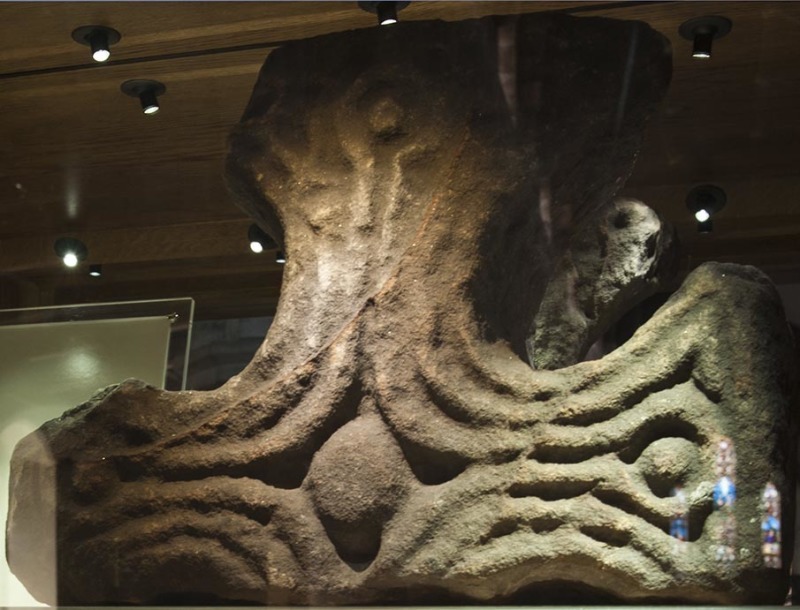 When it was carved Northumbria was still unshaken by Viking invaders. Over on the east coast the Venerable Bede was writing his famous History of the English Church and People in the monastery of Jarrow. The stones were discovered in 1847 when the chancel of the mediaeval church was rebuilt. We like to think that those who built the church had sensed the ancient sanctity of the stones and deliberately incorporated them in its walls. Our second-oldest fragment was also found in the wall of the chancel in 1847. Some people think it was part of the shaft of a small cross modelled on a split tree trunk (it has a flat face but the sides and back are rounded). Others believe it was part of a piece of church furnishing like a reading desk. Its relatively good preservation may indicate that it always stood under cover rather than being exposed to weathering in the open. Unlike the other remnants, this one has well-preserved patterns on all sides. You can see these reflected in the mirrors at the back of the show case, though experimentation is needed in order to find the best viewpoint! Experts say that the carvings mix Anglo-Saxon and Viking styles. The face bears a pattern of interwoven strands while the sides bear tightly coiled spiral strands and the back a tapering panel of plaits. The carving is said to date from the tenth century (900-1000 AD) and this fits the style, for this was a time when cultures and peoples mingled. From around 790 onwards Northumbria was threatened by Danish raiders and by 866 it had Danish rulers. By the early 900s Danish Northumbrians were spreading into the Eden Valley from the north to mix with the earlier Saxons and Britons while other Vikings of Norwegian ancestry occupied much of the western Cumbria by 950. So a blend of Anglian and Nordic styles on this piece of carving is not surprising. The third piece in the new show-case is just a tiny fragment of the top of another cross shaft, carved between 900 and 1050. The face shows parts of three animals - one climbing up the shaft and two coming down. They are carved in shallow relief, rather like the figure on the 'Loki stone'. The panel displays the head and forelegs of the uppermost animal; the hindquarters and head of the lowermost (which appears to be turning back to nuzzle its own tail), and the underside and legs of the climbing beast on the left. We aren't sure what kind of animal they are meant to be - although they do look rather like horses. The style of the carvings is certainly Viking, and the animals resemble others of this period from around the Irish Sea and especially the Isle of Man. There are also some parallels with the Gosforth cross. 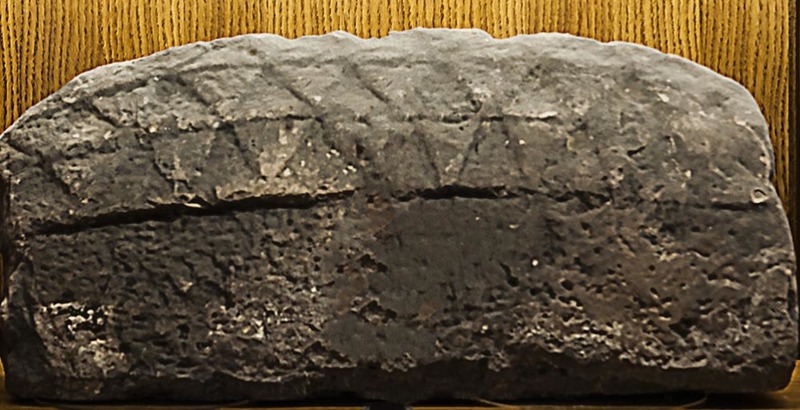 The side of the stone shows curving ribs and pellets and the back (visible in the mirror) bears criss-cross plaited lattice-work. At the top a horizontal bar is surmounted by interlace that experts say may have formed the edge of the original cross-head. Looking again at the front panel with the animals, there is clearly a raised margin down the right hand side and this seems to curve as if to run across the top of the block also. If this is so, then the downward-facing beast could never have been complete, and maybe the tail-nuzzler was also truncated below. Unlike most of the other stones, this one was not found in the church. 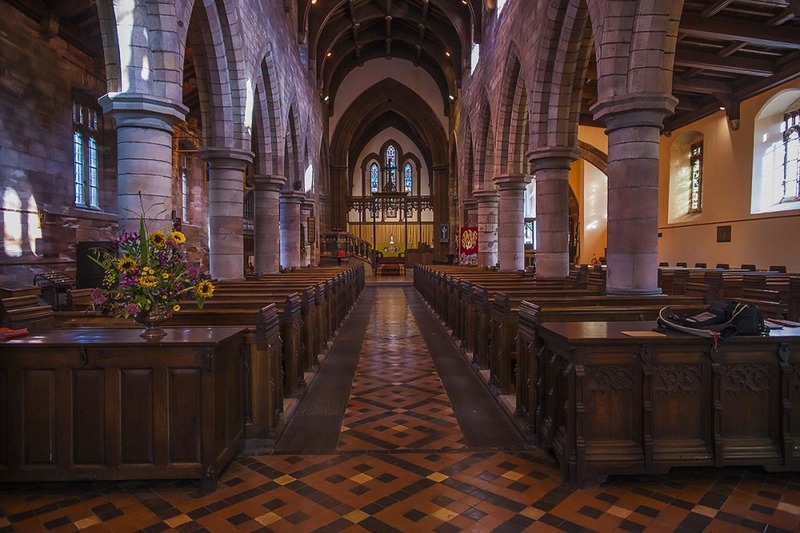 It came to light in 1911 during repairs to a building in Kirkby Stephen Market Square and was in the yard of a house in the town in 1936 when it was recorded by the Royal Commission on Historical Monuments. We are fortunate that it was then moved into the church and kept safely there. The show case includes the heads of three stone crosses - none belonging with the fragments of shaft, which are of different stone. The most striking (and oldest) is in the top centre of the show case. The stone it is carved from is not of uniform texture: a curving boundary between different layers of sediment, slightly different in colour, cuts across it. Possibly the makers did not mind this if they were going to paint the finished product, which would once have capped a tall shaft ornamented with carving. The cross head has a central boss surrounded by narrow mouldings that run out into the arms of the cross, where they surround smaller circular pellets. On the other side, partly visible in the mirror, the central boss is surrounded by a ring of moulding and the centres of the three remaining arms are not ornamented: at the end of the uppermost arm there is a row of five round pellets. The carving is simple and rather rustic, and it dates from the tenth or eleventh century - that is, between 900 and 1050 A.D. It is thus more or less contemporary with the 'Loki Stone' and the panel with the three beasts, and possibly also dates from around the time when the first church was built in Kirkby Stephen. 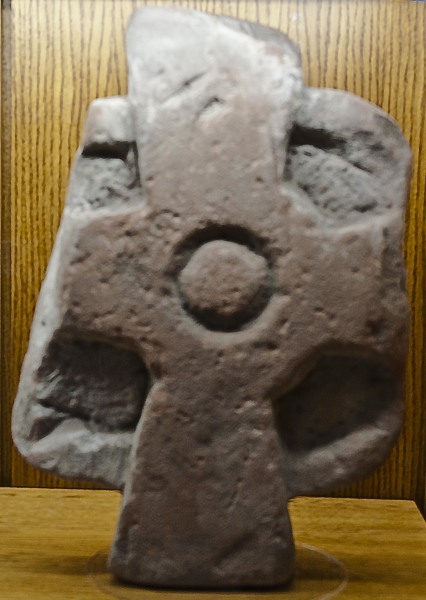 The cross head is another of the stones found in the walls when the chancel was demolished for rebuilding in 1847. We aren't quite sure where this battered and eroded fragment comes from! It was first recorded in 1899 but it is not among the pieces known to have been discovered in the walls of the old chancel when these were taken down for rebuilding. It is part of a cross head, and it dates from the tenth or eleventh century (900-1100). Only two of the four cross arms remain, and they spring from a round central boss. The arms are linked by a ring, giving the whole the appearance of a wheel (hence the description 'wheel cross'). Around the central boss there is a narrow strand and similar strands extend into the two remaining arms. Our third pre-Norman cross head is different again. It is of a type sometimes called a 'plate head'. It has been carved out of a large block of red sandstone. The arms stand proud of the lower part of the stone, and are linked by a raised outer rim rather like the ring joining the arms in the wheel cross above it in the case. The block has obviously been squared off, truncating the two side arms and removing most of the linking ring, and this was probably done when it was cut down and re-used as rubble in a later building. Quite evidently, this is a piece of rather rough local workmanship. The date is uncertain, but possibly eleventh century. We know it was in the church in 1899 but we do not know where or when it was discovered. The stone is of local type but not unique to Kirkby Stephen. The final stone on display in the Parish Church is a so-called hog-back tombstone. It gets its name because it is shaped rather like a pig! But actually it is a model of the 'long houses' people lived in during Viking times. Look closely and you will see that the top has a pattern like overlapping roof tiles. These end in a slight overhang representing the eaves. The lower flanks of the stone are plain, though a bit rough: in actual houses these walls would have been of plastered 'wattle and daub' standing on a stone or log foundation. 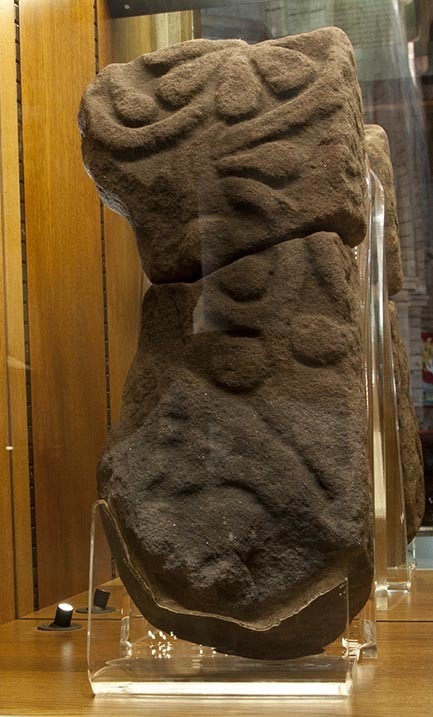 The hog-back dates from the tenth century (900-1000) and is one of several in the Eden Valley. One at Appleby has a woven pattern on the walls below the eaves, representing wattling. One at Lowther is more exciting because it has two longships with their crews carved on one of its side-walls and a series of six busts with long plaits of hair on the other. There are similar carved busts on one side of a second hogback at Lowther. Despite the lack of exciting detail the Kirkby Stephen stone is a good example of a Viking memorial. It suggests that although the tradition of burying grave-goods with the dead had ceased in Christian times, people still liked the security of a house above their bones! 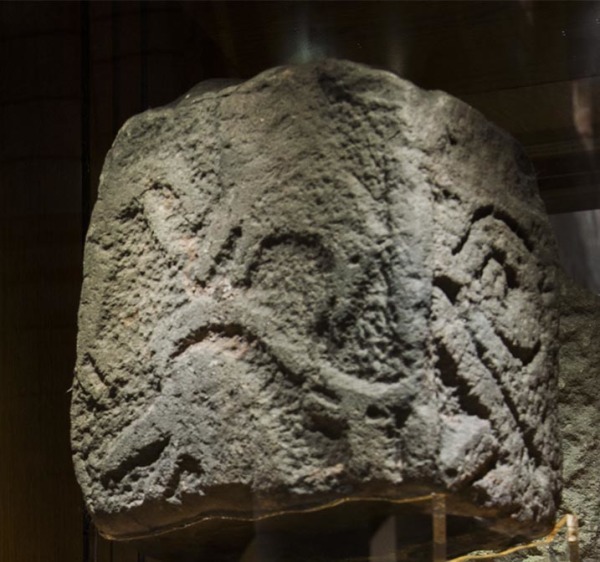 The Kirkby Stephen stones are a remarkable collection, showing how Christian sculpture developed in the nearly four centuries between 700 and the Norman conquest of Westmorland in 1092. 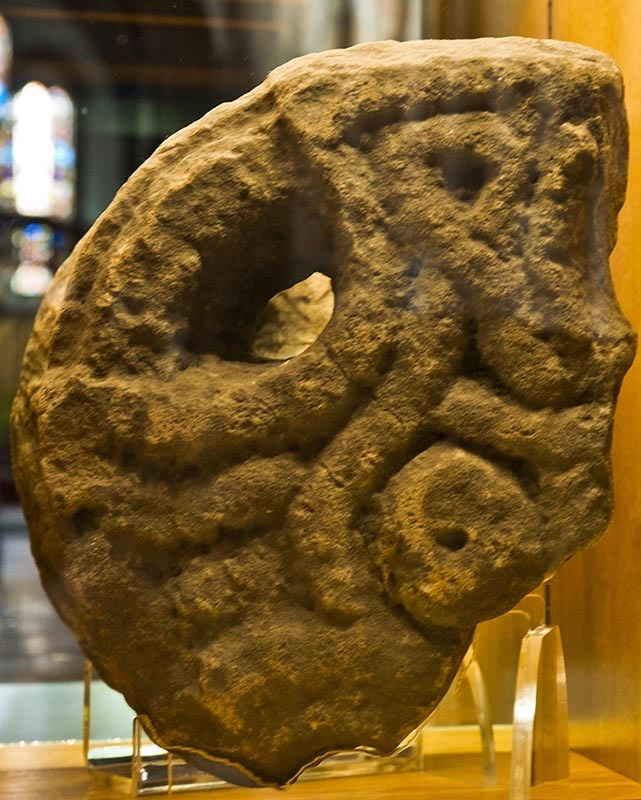 We are privileged to have them in our church, but they are, of course, only a small fraction of the wealth of Anglo-Saxon and Nordic sculpture remaining in the north of England. Go to Durham, for example, and you will find a far greater assemblage: go to Bewcastle or Gosforth and you will find free-standing crosses of far finer workmanship. We hope you will have been tempted by what you have seen here to go exploring more widely!